Australia Part I - Hamilton Island aka "The One in the Middle is the Cajun Kangaroo"
We landed in Brisbane at the crack of dawn (ok 7am or so) and took yet another flight to Hamilton Island. After mere moments to get cleaned up (after traveling for, oh, two days), we hit the ground running with a tour. I'm yawning just writing about it since I was so. damn. tired. at that point. Tooling around in a buggy (aka a golf cart) on the left side of the road did nothing but add to my dazed and confused state. After yet another brief respite, it was time for drinks and dinner. We dined at Qualia, the island's foremost luxury property. It was there that I had my first taste of kangaroo. Yes, you read correctly, kangaroo. Cajun kangaroo actually. And in my delirious state all I could think of was the Judy Blume book "The One in the Middle is the Green Kangaroo". The One in the Middle is the Cajun Kangaroo. Makes no sense whatsoever, I know. I wish I could tell you that dinner was delicious, but I honestly can't remember what I ate. I remember enjoying it, so that's a plus. But - and, how unlike me is this? - I skipped out before dessert. I figured it was less rude that falling asleep at the table! But one thing that did stick in my memory from dinner that evening was Tourism Queensland's launch of the Best Job in World Contest. 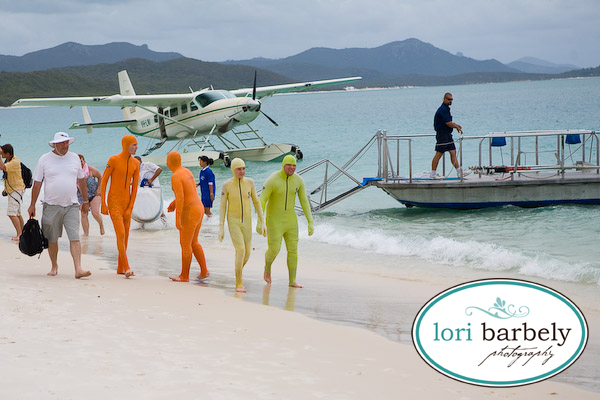 The lucky new employee gets to live on Hamilton Island for 6 months and serve as caretaker to the Great Barrier Reef. What does this entail? Snorkeling, swimming, meeting the locals, and blogging about it. As if that's not enough, there's a salary of $125,000 AUD (about $98,000 USD). Day 2 on the island brought lousy weather. I wanted to throw myself on the ground and flail and scream like a two-year-old. This was the ONE day of the entire trip that I wanted, no, I needed good weather. On the agenda for day 2? 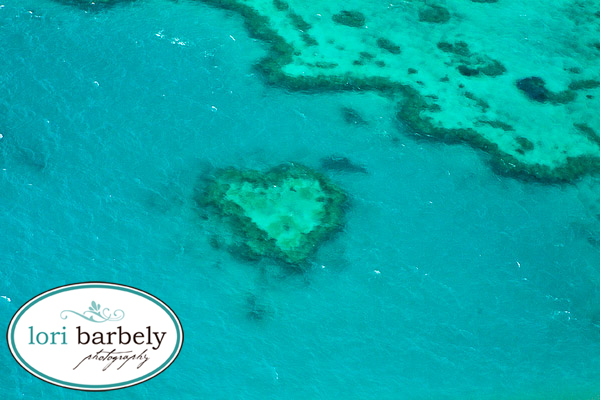 A seaplane ride over the Great Barrier Reef with a landing at Whitehaven Beach. It was that day that I learned that there was a cyclone a bit north of us, bringing in dreadful rain. Paired with a King Tide (an extremely high tide), that spelled photographic disaster. There was a point where we didn't think we'd be able to fly at all, much less land the plane at Whitehaven, but our uber-capable pilot pulled it off. It was at Whitehaven that I discovered (to a mix of delight and dread) that it was stinger season. AKA Jelly fish season. Which means that any water activities require the donning of a stinger suit, lest you get stung. The dread part, I think, is obvious. The delight was at seeing these lovelies in their stinger suits. Every sperm is sacred anyone? We didn't do any swimming at Whitehaven, so I was spared the public humiliation of wearing a stinger suit for another day. Our time there was brief - we shot some photos and enjoyed a bit of champagne and some fruit. 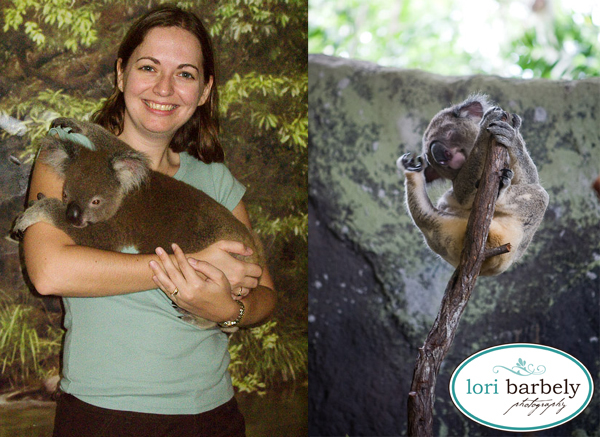 The other high point of the day was cuddling a koala. Now I know this is truly tourist cheese. But if you were me, could you really pass up the opportunity to have your photo snapped while holding one of these cuties? I think not.